Since you guys were so patient during our break last week while we were at Katsucon and Megacon, here’s this week’s page a day early! We do have some bad news though. We’re going to have to take the next two weeks off because we’re moving from San Diego to San Francisco. A bit of an undertaking! BUT the good news is, we’ll be having some guest art from some of our very talented artist friends to hold you over til we get back. If you missed our notice on the blog, we had an issue on the web site over the weekend. If you submitted your request for the Alex/Yuki backstory last week from Thurs-Mon, WE DIDN’T GET IT and you need to resubmit. So sorry about that! We put up a new voting incentive on TWC yesterday and we’ll leave it up til the weekend and then do a new one. And last but not least, we did a podcast! Listen to us drunkenly ramble about cosplay and comics. Guessing that one of them is Ryver and the other is Dionaea, the spirit influencing Ryver. So many opportunities, but I’ll leave the puns to someone else. 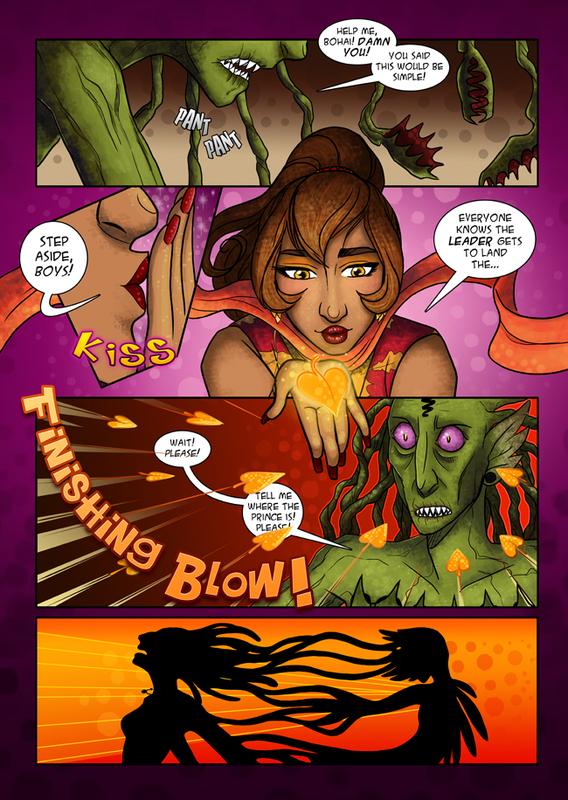 It’s a pretty great page, love the colors, and the way Raji looks in the third panel. It’ll be interesting to see what Dionaea is talking about. :3 Should we assume it’s David~? Aw crap! There’s a prince!? The plot! I wanna bet that it’s Alex but I’d probably be wrong. Now, I’ve got tons of questions: Prince? Hmm, who could it be? Is “Bohai” David’s real name? Why does Raji look so fabulous in the third panel? Love his new attack, literally leaf-point arrows, lol! Um, yeah, my brother is really into archery, so I picked up a few things. Have fun with the moving, guys! Hey all, new reader just finished reading the archive. Just my luck to find an awesome comic that’s on a break for a couple of weeks xD Good luck with the move you two! Also, if this is the end of the fight, does that mean we have to wait even longer to see Oliver’s sparkly transformation? T^T Show the ginger kid some love already! My good gentleperson, you win the internet.